Q Acoustics Concept 40 speakers to make their debut at Bristol Show 2014 | What Hi-Fi? We're big fans of the Q Acoustics speaker range here at whathifi.com, with the Concept 20s picking up our Product of the Year Award in 2013 and the 2020i also getting our vote as the Best stereo speaker up to £200. Now we hear there's a floorstanding version of the Concept 20, called Concept 40, about to make its UK debut at the Bristol Sound and Vision Show later this month. 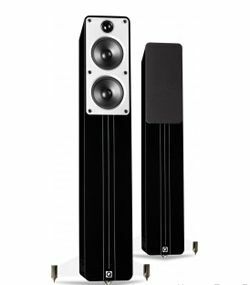 Retailing at £999 a pair, in either gloss black or white, Q Acoustics claims the Concept 40 will deliver "an unparalleled soundstage, dynamics and sheer musicality" thanks to its bespoke drive units housed in a Gelcore low resonance cabinet. The drive units have powerful, oversized magnets attached to them to lower the cabinet's resonance, and the tripod stand is designed to alllow the speakers to connect rigidly to the floor. The aluminium facia plate features a butyl clamp to help further reduce cabinet resonance. Sensitivity is 90dB/w/m, and with a speaker impedance that never gets lower than 4ohms, Q Acoustics claims the Concept 40s are easy to drive with any good quality amplifier. We'll be sure to bring you more details from the Bristol Show, and can't wait to get our hands on a review pair.